“Imagination is more important than knowledge. For knowledge is limited to all we now know and understand, while imagination embraces the entire world, and all there ever will be to know and understand.” – Albert Einstein. 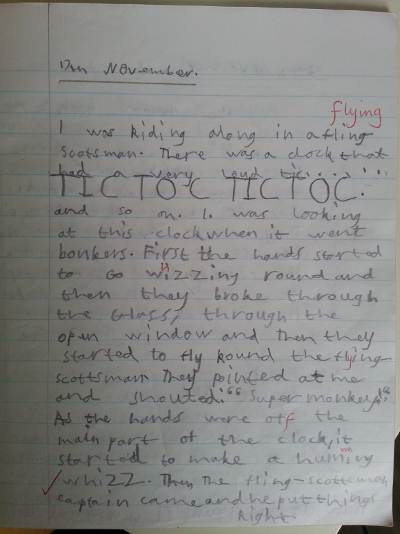 Reading diaries and journals in a way takes us back in time. (At least, it was the case in The Butterfly Effect! 😉 ) It’s a form of mental time travel. Reading through some of the stories, many of which were descriptions of my life at the time, really seemed to take me back. I was surprised at myself at how many of the events I could remember, and I could also remember how I felt. This in itself was an odd feeling…having different feelings back then than I would have now given the same circumstances. Time and experience has made me into a different person..but not in one go, rather, as a progressive series, building upon previous moments in my life. A couple of stories struck me, and I’m posting them here. “I was riding along in a flying Scotsman. There was a clock that had a very loud tic…….TIC TOC TIC TOC. and so on. I was looking at this clock when it went bonkers. First the hands started to go whizzing round and then they broke through the glass, through the open window and then they started to fly round the flying scotsman. Paul, some of stories are becoming rather silly. You have a good imagination so don’t only use it for funny stories. I expect your work to be much more interesting to read from now on. See me. Ah yes, the “See me.” comment! 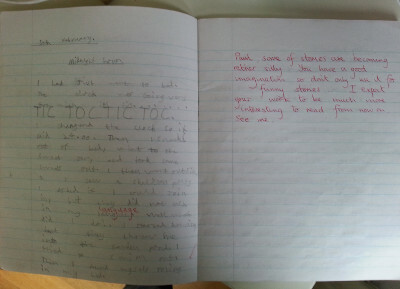 The true dread of a sensitive young schoolboy who wore his heart on his sleeve trying to write things down and getting called up in front of class to justify the wanderings of my mind to an elderly lady who couldn’t think past full stops and and capital letters (apparently she didn’t care for the definite article), and to the jeers of school mates hungry for some entertainment. I was very sophisticated back then. I used my sleeve for wearing my heart and not my snot. I guess Miss Powell (name possibly changed…) would have had it otherwise. Some 32 years later, I still disagree with her. The world is built on the backbone of imagination. I wonder what she’d make of this blog! I’d like to think that she’d approve of some out of the box thinking that has lead to reading some fantastic articles on other time travel blogs and websites, pieces of time travel fiction and watching time travel movies. To think that out of imagination come ideas which create and shape the world we live in. That through our minds, anything, if we really try, is possible.